When I first began researching Robert Patterson of York Co SC (more than a decade ago), I just didn't think there was much on him to be found. I knew he had a Last Will & Testament, which is more than a lot of people had in those days. I knew he owned land, but that's only going to show up in a handful of recorded ledgers. Let's face it, the man lived in the 18th century. How much could be found on someone who lived on the New World frontier, most of it in antebellum South where records were destroyed a century later, and it being a man who could not write as far as we know. After all, he made a mark - an "R" - instead of signing his name. Several years ago I got one of those proverbial burrs in my saddle and decided to build a "Timeline of Recorded Events" for ole Robert. Naturally, the first item on the list was his Last Will & Testament from July of 1775, the same year he died, incidentally. I added anything I could find to this list, from North and South Carolina, Virginia, and Delaware. It just had to be an event that was recorded and dated somewhere along the way - you know, a "primary source". When my list reached 20 events I was amazed and even shocked. I was impressed that Robert Patterson was "visible enough" to have been recorded in some manner that many times AND the records had survived two and half centuries. Harald Reksten has continued to review the numerous records along Robert Patterson's migration route and has shared much of this data with me over the years. The problem has been sorting out the various Robert Pattersons along the way. It has taken time for me to research the neighboring families in the various locations Patterson lived, but it has been necessary in order to gain a better understanding of which Robert Patterson was which. To my utter shock - and pleasure - many more of these "Robert Patterson" sightings have been this Robert than previously thought. These recorded events are too numerous to post in this article. Nor is that the purpose of this article. The scope of this article is "one-fold". Is that a word? It is now. Don't give up on looking for your ancestor! There. That's it. That's my point. I now carry a notebook with me almost everywhere I go. When I find another confirmed, recorded event for Robert Patterson, I add it to my notebook. I use this notebook for this purpose only, and for many ancestors, not just my 6-greats-grandpa. Would it shock you to realize that I have no less than 56 confirmed, recorded events for Robert Patterson from 1732 to 1825? Yes, a dozen or so of these recordings were done so posthumously, but they count. As far as I can tell, he lived in three locations only from 1732 to 1775. In Sussex Co DE he lived off the Broadkill River. In VA he lived on the waters of Linville Creek and Cooks Creek. In NC/SC he lived in one location off Clarks Fork of Bullocks Creek. A total of 55 56 times. This one thing I know - we'll find more [WP: since this article was posted, two duplications have been removed, but three more recordings have been found and added - 2 Aug 2011]. The earliest found was in 1732 in Sussex Co DE. The latest found was in 1825 in Rockingham Co VA.
Last night I was all set to post an article I'm calling "Part 2" regarding the specific location of Robert Patterson's 740 acres on Linville Creek near Harrisonburg, VA. But as fate would have it, a couple of new issues popped up. First issue - I found another map that gives a little more detail on the branches and forks of Linville Creek, so that is forcing me to make some changes to my custom maps. It's a wonderful development as it's more precise, but it's a little different so I need to make some changes before I can post it. Second issue - there may be one or even two more tracts that our Robert Patterson had there in VA, not just the three I've been talking about. Problem is, I'm not convinced either of those are his. One or both "could be", but it will take some time to determine that. One was for 100 acres, and the other for 150 acres. So for now, I will continue forward with what I have, which is three confirmed tracts for 740 acres. I'll make the changes to my "Part 2" article I'm almost finished with, approximating where this land was (within a mile or so, which is pretty dawg-gone close, if you ask me). And, we'll (Harald and I) continue to work on the other two tracts to determine if they belonged to our Robert "R" Patterson or the other one. About 30 years ago I remember my dad taking us to visit my grandpa Patterson's sister, Nellie Patterson Mason in north GA. My grandpa had already died a few years before that in 1975. Aunt Nellie was in her 70's already, but her mind was still sharp. Being that I was always interested in family stories, and that my name is Wesley, Aunt Nellie was reminded of a pair of brothers she remembered visiting on occasion as a child. They were her 2nd cousins, although at the time she didn't remember exactly how they were related. But what stood out to her, and to me too, was the fact these brothers were called "East" and "West". I'm sure that conversation was also in the context of her daddy, Elijah Patterson. "Lije" as he was called, had a twin named "Lishe". Lije and Lishe also had four more brothers named Lumpkin, Lewis, Alonzo and Bunyan. Plus, one of their six sisters was called "Jeff". Over the years many a chuckle escaped my breath when these names were remembered. Being a city boy I was not accustomed to hearing names like this. But as the years went by I became more interested in finding out who these brothers were. East and West. I assumed they were Pattersons, but I couldn't remember. I assumed they were my cousins too, but I wasn't sure. So the fond memory slowly became a mystery that had to be unraveled. About 8 or 10 years ago, while updating one of my Patterson branches with further details, I tripped across a record that indicated one of my cousins named John E. Patterson, was actually John East Patterson. So I began to dig further. I found another record that indicated his younger brother James, was actually James W. Patterson. Then I found it. James W. was actually James Wesley Patterson, and he was called "West" Patterson. His older brother John East Patterson was actually called "East". I found them! East and West Patterson were born in 1861 and 1870 respectively, in Fannin Co GA. They and their other siblings were children of George Washington Patterson and Margaret Ownbey. George was the son of John Patterson Jr and Sallie Hicks. Aunt Nellie and I descend from John Jr's brother George Patterson, and his son William Harden "Bill" Patterson, and his son Lije Patterson, previously mentioned. So Lije and Lishe were 2nd cousins of East and West. That would make Aunt Nellie 2nd cousins once removed, which in turn would make me 2nd cousins thrice removed. Mystery solved. But still a chuckle. How Many Sons Did Old Robert Patterson Have After All? 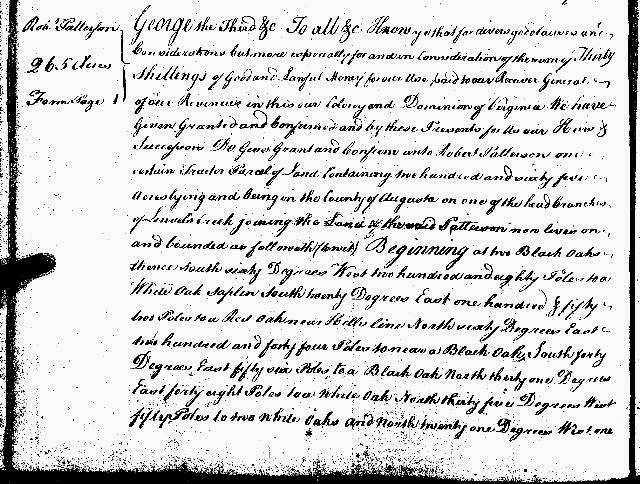 Robert Patterson wrote his last Will & Testament in July of 1775 in York Co SC. He died no later than November that same year. Robert was my gggggg-grandfather. For years, all we've known for sure concerning how many sons he had was the four sons named in his Will, viz. Thomas, Robert, Peter and William. But were there other sons? Naturally, anyone would agree that there could have been other sons that died young, but how could you ever prove it? There just isn't any empirical evidence that other sons existed. Right? Well, maybe there is enough evidence to suggest there were more sons. At the very least, there appears to have been a son named James that can now be "confirmed". I would also suggest there could have been a son named John, but that cannot be proven or disproven at this time, to my knowledge, so I'll leave that discussion for another time. James Patterson. We know he existed. We've known for years there was a James Patterson living close by on Clarks Fork of Bullocks Creek in what is now York Co SC, but who was he? Why wasn't he named in Robert's 1775 Will? For years I suggested to Harald Reksten that James could have been a son of Robert. But I didn't see enough of the big picture to be able to prove it one way or the other. Eventually, I stopped suggesting this. Then recently, Harald suggested it to me based on the evidence he was finding in the land records. Harald's theory? James Patterson died before his father Robert died in 1775. He was also single and therefore no estate was administered for dependents. Hmmm... that theory works. But proving it is another story. 1. Mecklenburg Co NC, Book 23, Page 163. 26 October 1767 Grant #438 to Robert Cravens 150 acres on Clarks Fork of Bullocks Creek adjacent Robert Patterson line. Chain Bearers: James Petterson, Newberry Stockton. Plat: 17 January 1767. File #2251. 2. Tryon Co NC, Book O5, Page 072. 23 February 1774 Robert Cravens of Augusta County, Colony of Virginia and Wife Esther to James Patterson of County of Tryon, North Carolina for £90 Va. currency, 150 acres in the county of Tryon, NC, on both sides of Clarks fork of Bullocks Creek adjacent Robert Patterson's line. Signed: Robt Cravens, Esther Cravens (LS). Witnesses: Robert Patterson, Joseph Dictum , John Quin. Proved by the oath of Robert Patterson 4 June 1774 before Joseph Robinson, J.P. Recorded 15 March 1785. The Robert Patterson in both records was most likely Robert Jr, the brother of James Patterson. A few years ago I obtained a copy of the 1774 deed and the Robert Patterson did not have the trademark "R" mark that Robert Sr used. So I am convinced it was Robert Jr.
Esther Cravens was born Esther Harrison, daughter of Jeremiah Harrison and Elizabeth Patterson. Therefore she was the 1st cousin of James and Robert Patterson. Joseph Dictum married another first cousin of both Esther Harrison Cravens and James Patterson. If Harald's theory is true, in that James was a son of Robert Patterson Sr, then James died between February 1774 and July 1775. Robert Sr must have already had a Will in place with as much land as he owned in VA and SC (Clarks Fork of Bullocks Creek was deemed to be in York Co SC around 1775). It would stand to reason that Robert would have re-written his Will if one of his sons died unexpectedly. I believe this is why Robert wrote his Will in July 1775 in order to update it. But still that's no proof. If James were single, his assets would have devolved to his father. So the smoking gun question is this. Is there any evidence that Robert Patterson Sr ever came into possession of James' 150 acres he purchased from Cravens in 1774? This is about as solid a case as one could ever present. My hat is off to Harald Reksten for working through the details on this one. He presented the theory to me a few months ago and then recently found this 1802 deed, which to me is empirical evidence. The sons of Robert and Sarah Patterson at the very least include Thomas, James, Robert, Peter and William. Elizabeth Patterson was born in the 1750's and was a daughter of Robert and Sarah Patterson. Robert was my gggggg-gf, and I descend from him two ways, through his son Thomas Patterson, and also from his daughter Sarah who married Joseph Black. Elizabeth married a man named Daniel Ponder (Jr) in the early 1770's in York Co SC. Around the turn of the century they moved to Buncombe Co NC and attended the same church as my John Patterson family, Newfound Baptist Church, about 8 miles NW of Asheville, NC. Daniel and Elizabeth Patterson Ponder were very active in the church. Daniel died in 1817, Elizabeth some years later. Robert Ponder was in Clay Co. KY with the rest of the boys when Daniel died 1817. He went back to Buncombe to live to care for Elizabeth and I can't tell you off the top of my head which census, but you will see an elderly lady with him at some point. The grandson we talked to said Elizabeth is buried atop that hill with Robert on Robert's old property. So I emailed Pat this week to get more details about the location of Elizabeth's grave. To my utter disappointment, here was Pat's reply. The way I understand it, the graves atop Ponder mountain were taken up and the land used for farming in about the 1930's when times were tough. This came from an old fellow (Ponder) who was born there and lived just up the road. The property was on Little Ivy and Ponder's Branch and went from mountaintop to mountaintop. It has been too long to tell you the name of the road but there's a Sprinkle Cemetery somewhere near the crossroads that has Robert Ponders daughter Elizabeth Ramsey in it. I am talking about 25 years ago though on all of this. We did not climb up the mountain to see if the graves were gone because he was so certain that they were and we didn't want to insult him. Such is life when it comes to genealogy research. In the words of Forrest Gump's mother, "Life's like a box of chocolates. You never know what you're gonna get." You win some, you lose some. I guess I struck out on this one. Are you familiar with the movie Lonesome Dove? Then you should also be familiar with the character Gus McCrae, played by actor Robert Duvall. As pop-culture would have it, we Americans have adopted aspects from this movie into our own culture, such as the specific type of cowboy hat worn by McCrae. This particular hat is called a "Montana Gus". Don't ask me why. It was news to me, too. Just this week my cousin Jerry returned from his annual pilgrimage to Jackson Hole, Wyoming. 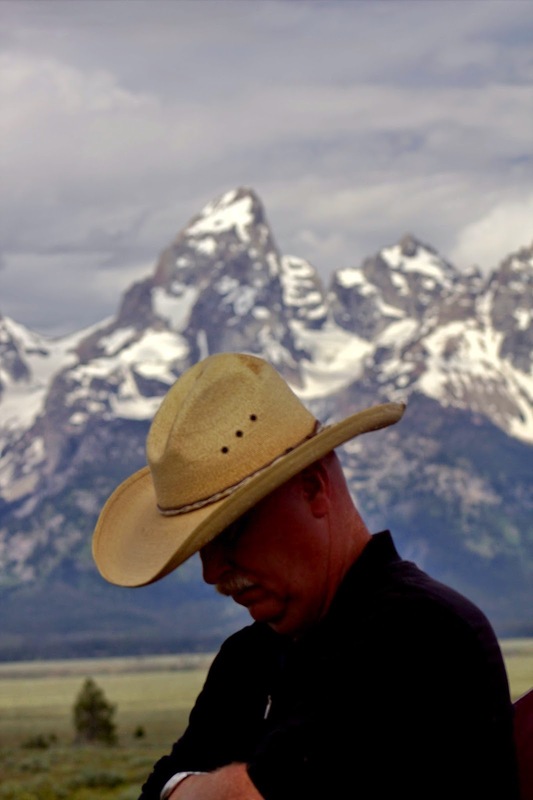 You know... the Grand Tetons... spectacular, western landscapes... Lonesome Dove! It's easy to see why Jerry loves to visit Jackson Hole each year. The following picture gives us a glimpse of the Grand Tetons in the background. But wait a minute! The mountains aren't the focus of this photographic masterpiece. Behold! I present... Jerry Patterson in a self portrait demonstrating the "Montana Gus". Jerry Patterson - Jackson Hole, WY - the "Montana Gus"
First of all, I want to thank Vickie Moon from Augusta Co VA for finding the burial record of Lewis O. Patterson for me. I knew that Uncle Lewis lived and died in Cleveland, TN, but never knew where he was buried... until now. Lewis Patterson was the older brother of Lije Patterson, my great-grandpa. Lewis was buried in Fort Hill Cemetery, and the "Findagrave.com" record says "Plot: 12, Plot 494". I'm assuming this means row 12 and plot 494. It also says his birth date was May 20, 1869 and his death date was March 22, 1959. I knew the years for both, but did not know the exact dates... until now. The makeup of Robert Patterson’s land holdings in Augusta Co VA during the mid 18th century appears to have been sorted out at long last. For years, many researchers have attempted to sift the maize of records concerning the Robert Patterson who lived along Linville Creek, a few miles west or northwest of Harrisonburg, VA. This Robert Patterson migrated from Sussex Co DE to the Shenandoah Valley around 1738 while in his late 20's or early 30's. Eventually, he moved to York Co SC where he died in 1775. "This Robert Patterson?" you might ask. The first issue was to sort out the many Robert Pattersons who lived in old Augusta Co VA. There were two older, contemporary Robert Pattersons. It doesn’t help that both Roberts had sons and daughters by the same names (Thomas, Robert, Mary, etc), and even had dealings with neighbors and relatives by the same last names (Stewarts, Browns, Ralstons). Ultimately, it comes down to the specific location, and the individuals who lived THERE. This Robert Patterson was the only one of that name to live at the head of a branch of Linville Creek. In 1764, this Robert obtained a land patent for 265 acres on Linville Creek. This was the only land we knew of for many years... until recently. Secondly, it has simply taken years to soak in all the records, such as land entries, patents, deeds, court records, etc. And not all deeds were recorded, throwing another monkey wrench into the works. A close friend and distant cousin, Harald Reksten, has worked tirelessly over the last few years scanning microfilm rolls for all these records in all related counties (Orange, Augusta, Rockingham). Without Harald's work, we'd still be stuck for sure. And yet another issue is the fact that many land entries (first step leading to a land patent – the VA term for land grant) were listed with one number of acres, while the subsequent patent may have been for a different number of acres. Furthermore, the patent was not obtained in many cases for 20 or 30 years after the land entry. Such were the cases with our Robert Patterson. Thankfully, he made his mark with an "R" - as opposed to an "X" - and that certainly has helped identify him in more than one case. It seems old Robert ended up with three separate tracts of land over the years he lived in VA. All were next to each other, and all were located on Linville Creek. There may be another record or two yet to find that can pinpoint specific dates of some of the transactions involving these three tracts, but enough details have been found to identify the tracts and the subsequent disposition of those lands. Robert and his wife Sarah sold their Sussex Co DE land (106 acres) in March of 1738 as they prepared to follow their relatives and friends to the Shenandoah Valley of VA. Robert’s first land transaction on the new frontier was a Land Entry for 230 acres on 15 Nov (no year, but believed to be 1739), in Orange Co VA. Augusta Co had already been formed but did not have its own county seat until 1745, so most of the land transactions and court cases involving this region were still facilitated under the old Orange Co. For whatever reason, many of these presumed 1739 land entries were repeated between June of 1740 and June of 1741. Once again, Robert Patterson recorded a Land Entry for 230 acres in Orange Co VA, this time on 12 Nov 1740. I shall refer to this as “Tract 1”. “Tract 2” was first recorded as a survey for 75 acres adjacent to Robert Patterson’s first tract. This survey was completed on 12 Feb 1755, and was described as being on the south side of his own land. More details on this tract momentarily. “Tract 3” contained 400 acres originally patented to Robert Rolestone (Ralston). Ralston recorded his land entry in 1755, although his land patent wasn't recorded until 1768. We know from an 1825 deed, that this 400 acre tract was sold by Ralston to Robert Patterson, who in turn sold it to Henry Ewing and Robert Cravens (Jr) in 1774. So Robert Patterson bought the land no earlier than 1768 and then sold it by 1774. Here's where it gets interesting. In 1781, a man by the name of John Brown recorded a deed for 75 acres (Tract 2 above) and was described as the "assignee of Robert Patterson". In other words, Robert Patterson assigned Tract 2 to John Brown, sometime before 1781. Since Patterson died in 1775, and moved to SC in the 1760's, we can safely assume it was in the 1760's when the assignment took place. 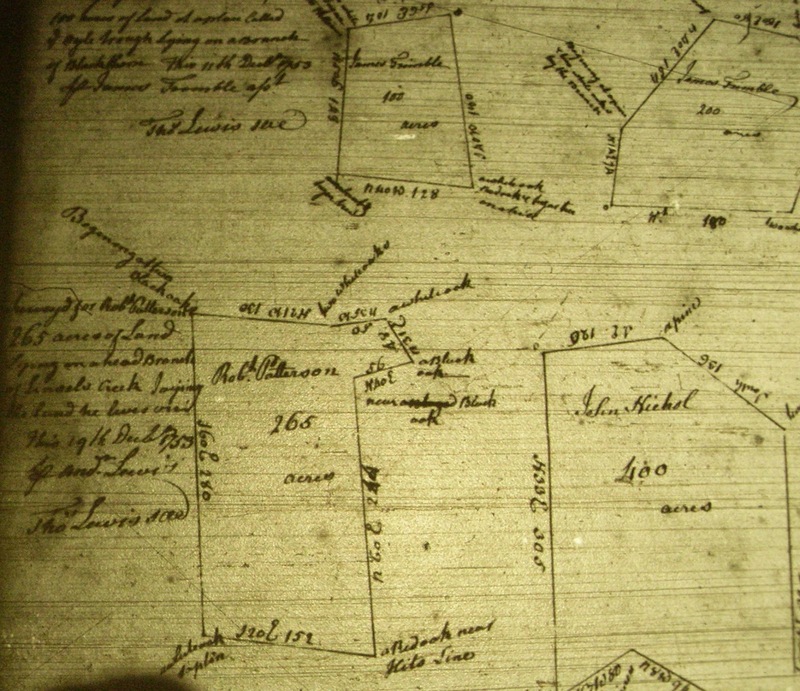 More importantly, this 1781 deed described the 75 acres as being on the south side of Robert Patterson's "patent land". Robert Patterson patented 265 acres on 27 June 1764. It was most likely around this time, or within a year or two, that Patterson assigned Tract 2 to Brown, as Patterson and others moved to what is now York Co SC. We also know that Patterson was living on the 75 acre tract according to the 1764 patent which said "adjacent to land Patterson already lives on." It's interesting that when Tract 2 was surveyed in 1755 it did describe Robert's other land (Tract 1) being north of the 75 acres, but it wasn't refered to as "patent land", as in the 1781 John Brown deed. But that's because he didn't bother to get a patent for it until 1764. We also can deduce that Tract 1 "grew" from 230 acres to 265 acres in the 25 years that transpired between the Land Entry and the Land Patent. It was not uncommon for patents and grants to differ somewhat from the original Land Entry. We know that Tract 2 was disposed of in the manner described as "assigned to", in this case, John Brown. We know this is our Robert Patterson since in 1758, he and John Brown, plus another man named Joseph Bryan, were the appraisers for the estate of Benjamin Copeland who had died a few years prior. In their appraisal record, Robert Patterson made his mark "R", while John Brown made his mark "J". Joseph Bryan signed his own name. So we see there was already some history between our Robert Patterson and John Brown. Some will find it interesting that the third appraiser, Joseph Bryan, was the father-in-law of the famous Daniel Boone. We know that Tract 3 was sold in 1774 to Ewing and Cravens. My theory is that Robert's son, James Patterson, was living on Tract 3 for several years until 1774. In fact, in 1767, James Patterson was a chain carrier for Robert Cravens Jr in SC where the Patterson clan had moved (Clarks Fork of Bullocks Creek). Turns out, Robert Cravens never lived in SC, but his brother William Cravens did, most likely on his brother's land. This was very near other relatives such as Thomas Patterson and Nathaniel Harrison. It seems that William Cravens and Thomas Patterson married sisters of said Harrison. It should also be noted that Nathaniel Harrison was one of the witnesses to old Robert Patterson's will in 1775 in York Co SC. Thomas Patterson was Robert's son (and my ancestor). And, Robert Cravens Jr was married to Esther Harrison, the niece of Robert Patterson. So what happened to Tract 1? The 265 acre patent was still in Patterson's possession at the time of his death in 1775. He left his "Virginia claims" to his sons Robert (Jr) and Peter. In 1787, Robert Jr and Peter Patterson sold Tract 1 to John Ewing Jr, son of Henry Ewing. Therefore the majority of Robert Patterson's land ended up in the Ewing family. So it seems that Robert Patterson possessed a total of 740 acres on Linville Creek. Tract 1 was 265 acres, although entered in 1739/1740 as 230. Tract 2 was 75 acres, and Tract 3 was another 400. It should be noted that Robert Patterson lived on Tract 2 (75 acres) during the latter years of his stay in VA. It appears that we now have a grasp of all the lands possessed by Robert Patterson of Linville Creek VA, as well as the disposition of those lands in later years. The same can be said for the land he possessed in DE prior to migrating to the Shenandoah. Perhaps one day we'll be so lucky in regards to his SC land. Legends are the stuff that dreams are made of. Glory, grandeur, drama. When we think of legends we think of King Arthur, William the Conqueror, George Washington, General Custer, Daniel Boone. We often think of legends as the first to do something. Or, the greatest at having done something. Most of the time, however, our assumptions about these legends are highly inaccurate. At the very least, exaggerated. For example, Daniel Boone. Yes, he was a great explorer, but there were many failures on his part along the way. That's okay, though, as persistence won the day for him. No problem. Likewise, Boone was not the first explorer or even the only explorer to traverse the frontier in most places he traveled. He was simply the most famous. When the Boone family first left Pennsylvania for the frontier, they traveled to the Shenandoah valley of VA. Daniel's parents, Squire and Sarah Boone, sold their PA land in 1750 and moved to the Linville Creek area of VA near modern day Harrisonburg. They only remained there for a year and then followed the many families who were migrating to the Yadkin River valley of Piedmont, North Carolina. But have you ever wondered why they moved to Linville Creek, VA and then to modern day Mocksville, NC? The Boones were not the first families to make those moves. Many families had already begun settling the Linville Creek frontier region of VA in the 1730's. Families like the Linvilles, Harrisons, Cravens, Stewarts, Pattersons, Blacks, etc. By 1750, dozens of other families had arrived, such as the Bryans and Morgans, families which the Boones were heavily intermarried with (plus the Linvilles). My gggggg-grandfather was Robert Patterson, born circa 1711. He bought 106 acres of land in Sussex Co DE in 1732 and then he and his wife Sarah sold it in March of 1738. That was when they moved to the Linville Creek part of VA, following their relatives and neighbors from DE who began the migration in 1737. By 1748, Joseph Bryan was already in the Linville Creek vicinity. Joseph Bryan was a pillar in the community for the decade or so he lived there. He was married to Alice Linville, sister of William and Thomas Linville. The Linvilles were close neighbors to Robert Patterson. Additionally, Bryan's sister Elinor was married to William Linville. Here's where the Boones come in... Joseph and Alice Bryan's daughter, Rebecca Bryan, married Daniel Boone in 1756 after they had all moved to NC. Another daughter of Joseph Bryan, named Martha, married Edward Boone. Furthermore, Joseph's brother, William Bryan, married Mary Boone, sister of Daniel Boone. Suffice it to say, the Boones and Bryans had a lot of mistletoe on their farms! On March 15, 1755, the estate of Benjamin Copeland was appraised at Linville Creek, VA. Three men were appointed by the court to appraise Copeland's estate, to wit: Robert Patterson, Joseph Bryan, and John Brown. There were several Robert Pattersons in Augusta Co VA during those days, but there is no doubt as to which Patterson this was. My Robert Patterson did not sign his own name, he always made "his mark". But instead of an "X" he always made an "R". See the following image of the signatures and marks of the three appraisors. 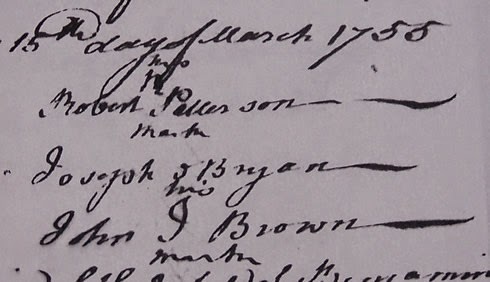 Notice that Patterson and Brown both made their marks, while Joseph Bryan signed his name. By the following year, the Bryan family were in NC with their daughter Rebecca getting married to the famous Daniel Boone. They had known each other in PA, and then lived near each other (probably the very same farm) on Linville Creek in VA in 1750-51, and were then reunited in NC by 1756. I find this appraisal record very intriguing, however. My ancestor being so closely involved in local matters with a man who was otherwise just an ordinary, run of the mill, normal man - Joseph Bryan. And he was a common man, as was his son-in-law, Daniel Boone. Legends truly become legends after they're long gone from this old world. I would dare say this was true in the case of Ole Dan'l, as well. In 1750, he would have been a spry 16 year old while living near my Patterson clan. I wonder what sort of pranks he was known for carrying out? I'm sure my family could have told you "way back yonder". Newfound Baptist Church is located in Buncombe County in the town of Leicester, about 8 miles NW of picturesque Asheville, NC. This church (NBC) is important to my family research due to the fact that so many ancestors and other relatives attended there from its founding in 1802. The survival of the church's monthly business meeting minutes has been a wonderful blessing to researchers over the years. My gggg-grandparents attended NBC and raised their children in this church. John and Margaret Black Patterson were in their late 30's when the church began. Their son George (my ggg-gf) was born just a couple years prior to this, in 1800. We know our family attended the church through 1815. Other relatives attended longer also. Furthermore, one of the three Sarah Blacks listed on the 1807 membership list was most likely the mother of Margaret Black Patterson, and therefore my ggggg-grandmother. In fact, Sarah Black was Sarah Patterson Black, the aunt of John Patterson. Yes, that makes John and Margaret 1st cousins! John Patterson was mentioned some 15 or more times in the church minutes from 1803-1815. For a time he was even the church clerk and would have been the one writing the minutes. Keep in mind however that all of the minutes prior to 1850 were re-written at that time to preserve them, so the existing minute books are only that old, and therefore not in John's hand. Nonetheless, John's wife was mentioned on four occasions, one of which recorded her as Peggy Patterson. No other known record documented her nickname to my knowledge, so already we see the importance of these church records. Another family of interest is the Huckabee family. Three Huckabees were listed on the 1807 membership roll, including "Joshuay Huckkerby" and his wife "Jane Huckkerby", and their son "Berry Huckaby". Joshua Huckabee was recorded two more times as "Bro. Huckerby", on 19 Aug 1809 and 19 Dec 1812. Joshua and Jane Huckabee are not recorded again. Berry Huckabee was recorded five more times under various spellings. Furthermore, his wife Elisabeth was mentioned three times. 20 May 1820, "Received Bery Huckkerby by ex [experience] into our church". 19 Aug 1825, "Bery Huckerby" was listed as a deligate to the conference. 19 Aug 1825, "Received Elisabeth Huckby by ex". 17 Dec 1825, "Berry Huckby and Elisabeth Huckby" applied for letters of dismissal and were granted such, along with several other members. 17 Mar 1827, "Appoints Bro. Bery Huckerby signing clerk", so obviously he was back in fellowship again. 17 Nov 1832, Received back into fellowship by "recantation" and then granted dismissals from membership for both "Berymon Huckaba and wife". The Huckabee clan later moved to Georgia and Mississippi and then Arkansas. 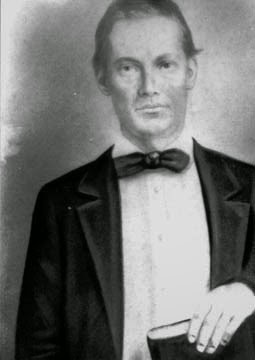 Old Joshua Huckabee was born circa 1750 in VA.
His son Berryman "Berry" Huckabee was born in 1795 in VA.
His son William M. Huckabee was born 1817 in Buncombe Co NC. His son Berryman William Huckabee was born 1851 in GA.
His son Lucius Elmore Huckabee was born 1876 in Arkansas. This man was the great-grandfather of Gov. Mike Huckabee. Therefore, at Newfound Baptist Church in Leicester, NC during the early 1800's, Gov. Mike Huckabee's ggggg-grandparents (Joshua and Jane) and gggg-grandparents (Berry and Elisabeth) were in attendance at the same time my ancestors were. This is not meant as any claim to fame or any such notion. Simply an acknowledgment to the fact that we Americans have more in common than meets the eye on any given day. Trivial nuggets like this jump out at me and simply bring a twinkle to my eye. It also makes me wonder how much more of this is out there, and we've simply missed it, usually because we don't know to look for it in the first place. A former preacher at the church I attend here in Winston-Salem, NC had a saying that stuck with me. You know how it goes when something happens that prompts someone to quip "It's a small world"? Rod Sharp would hear that and immediately reply with "Large family!". There's a lot of truth to that. I've especially come to realize this in recent years with genealogy research. It's no longer a shock when searching records from a different family to all of a sudden find overlapping kinship with some of my relatives from 200 years ago. For the better part of a decade now I've been drawn in my research over and over to several individuals and families. There was never any proof or even strong indication of any relationship between my family and theirs, but I knew the possibility was there. I'm speaking of men like William Cravens and Samuel Stewart. And pretty much the entire Isaiah Harrison clan. Who? you might ask. They were men and families that migrated from Sussex Co DE to the Shenandoah Valley of VA (around Harrisonburg) in the late 1730's and 1740's. My Pattersons and Blacks did likewise. And yes, there was intermarrying between my family of some of the others, but no obvious direct descent on my part from the Cravens, Stewart or Harrison families. Nonetheless, I have continued to follow the Harrison clan, not only in DE and Augusta/Rockingham Co VA, but also in York Co SC and the Yadkin River region of NC (Rowan/Surry/Stokes/Forsyth/Yadkin Co's). There is a definite kinship in these families, plus I live here in Forsyth Co NC within 2 or 3 miles of where a group of the Harrisons and Stewarts moved to around 1750. Furthermore, when there is a name like William Cravens Patterson (1813-1864) in the family, you pay attention to associates like William Cravens. Harald Reksten and I have continued working for years on these families as well. Harald is very methodical in his approach to research and it benefits all who come in contact with him. We both do a lot of research and share our work with each other all the time. In the last couple years, various details have come to light which present a very intriguing picture, especially to me in that 1) it seems now that I do descend from the Harrison clan, 2) the branch of the Harrisons I connect with seems to be present in Augusta Co, VA as well as Rowan Co NC and York Co SC, 3) this same Harrison branch seems to tie into the families of both William Cravens AND Samuel Stewart, and 4) I live within a few miles of one of the key locations, in particular, where Samuel Stewart died and is buried apparently. In other words, it now seems that my Thomas Patterson (b ca 1740, d 1802-10) was married to a Margaret Harrison (more info on their marriage). Harald and I have worked extensively on the Harrison clan to find any possibly connections. Harald has focused on court records of all kinds from all pertinent counties in VA, PA, DE, NJ, MD, the Carolinas, you name it. His work has brought to light certain variables that are key to piecing the Isaiah Harrison clan together. There just isn't much out there in the court records on Isaiah Jr, oldest son of Isaiah Harrison. We no longer believe him to be a likely candidate for much of anything, especially the theories of being the progenitor of the Rowan Co NC Harrisons, or the York Co SC Harrisons, or the Lydia Harrison who married Samuel Stewart, or even the Isaiah Harrison who executed the 1748 estate settlement of Joseph Harrison in Augusta Co VA. In reality, it seems Isaiah Jr may have died at a fairly young age in DE or NJ perhaps. Speaking of Joseph, he's the other key variable in Harald's research. Joseph was a key player in the records of DE, something not brought to light in J. Houston Harrison's Settlers by the Long Grey Trail. So much information has come to the forefront in recent months regarding this Joseph and his connection with the rest of the Isaiah clan, he has to have been another son of Isaiah Sr. Joseph was born ca 1700-1705, probably around 1702 or thereabouts. We also believe that Lydia Harrison, wife of Samuel Stewart, was another daughter of Isaiah Sr. The children of Isaiah Sr by his second wife Abigail Smith just weren't documented as well as the children by his first wife Elizabeth Wright. Furthermore, the presence of Joseph Harrison at Harrisonburg, VA in the 1740's matches the timetable of the Harrisons of Rowan Co NC and later York Co SC. Both clans have Josephs and Nathaniels, Johns and Thomases, etc. Furthermore, their is DNA proof that the SC bunch (later in Buncombe Co NC) is related to the Isaiah Harrison clan. Their migration routes mirror that of my Thomas Patterson and Margaret Harrison, who married in 1761 in Augusta Co VA. Too much to go into here and now, but the evidence is quite striking. It is our theory (no proof, just theory) that Margaret Harrison (m Thomas Patterson) was a daughter of Samuel Harrison (I used to think Joseph, but now think it was his brother Samuel). We also believe that an additional daughter of Samuel Harrison was Jane (m William Cravens), whereas Abigail (m David Stewart, son of Samuel and Lydia Harrison Stewart) was most likely a daughter of Joseph Harrison (d 1748 Augusta Va). Sons of Joseph Harrison would have been Isaiah, Joseph, and John. As for Samuel's sons, Nathaniel and Thomas for sure, possibly others. In 1748, after Joseph Harrison died, a group of this family moved to Rowan Co NC near the Yadkin River in what is now Forsyth Co near the Yadkin Co border. This included Samuel Stewart and his entire family, plus Isaiah Harrison (son of Joseph), and eventually others like Joseph (Jr), John and Thomas. Abigail, who married David Stewart, was also here in NC. In the early 1760's, other Harrisons - apparently Samuel Harrison and his children and their families - moved from VA to the Kings Mountain area of SC in modern day York Co. This included Nathaniel and Thomas, plus Margaret (m Thomas Patterson) and Jane (m William Cravens). It also included many members of the Black family and the entire Robert Patterson clan (father of Thomas). If the above relationships are correct, and there is a lot more evidence than what I've shown here to indicate so, then when I look at William Cravens, I now see an uncle (his wife being a sister of my Margaret Harrison Patterson). When I look at Samuel Stewart, I now see an uncle (his wife being a sister of my Samuel Harrison). Most of the Stewarts and Harrisons eventually moved away from the Yadkin River area, but two families stayed here, died here, and should be buried here - somewhere. That being Samuel and Lydia Harrison Stewart, and David and Abigail Harrison Stewart (Stewart Timeline). "They came down HERE shooting at us and I was just protecting my homeland!" Imagine my surprise last night when I received an email from cousin Dave Huskey - which is no surprise in itself - but rather the contents of which contained a quote from my great-great-grandpa, Bill Patterson. Dave's email contained a scanned copy of a letter written by Sue Tucker to Shirley Huskey, the latter of which is Dave's mother. Sue Tucker and Dave's father (the late James A. Huskey) were cousins, and both grandchildren of Callie Patterson Hickey, daughter of Bill Patterson (1832-1883). In this letter, dated June 24, 2011, Sue writes about memories of growing up and various family members she recalls, such as Aunt Florence being in a nursing home, and at other times visiting Lije and Lishe, the twin sons of Bill. She also mentions Aunt Em, and Uncle Bunyan and his daughter Elaine Patterson Gibby. Granny's daddy never had slaves (didn't believe in that, he was a lay minister)! Granny said he went out side to pray alone every morning while they got breakfast. But when asked why he fought for the South he replied that "they came down HERE shooting at us, and I was just protecting my homeland!" I know that to have been the case for the majority of Confederate soldiers, but there are always exceptions to every rule and scenario. It is very striking to me to find that this was, in fact, his feeling as well. It's also touching and inspiring that he would spend time praying every morning. I can imagine he would need to go outside for privacy, when you have 12 children. A meal time would be the one time they'd all be together, and you could go SOMEWHERE ELSE for some privacy. The more I learn about "Billy" Patterson (as his step mother Sophia always called him), the more I am impressed with him. Family, Country, and God. I guess this quote confirms his mindset was like most others in those days... your state was your country. Georgia was Bill's "homeland". I missed this picture last night when I posted seven others to the Bill Patterson Family Gallery. 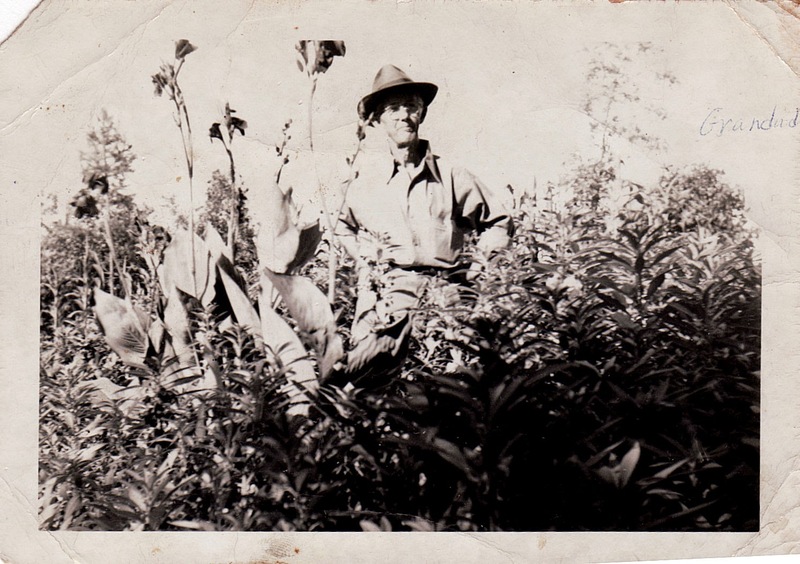 This is of my great-grandad, Joseph Elijah "Lije" Patterson (1871-1957). More and more pictures of older family members continue to pour in. The last 5 or 6 weeks have been quite exciting for me. 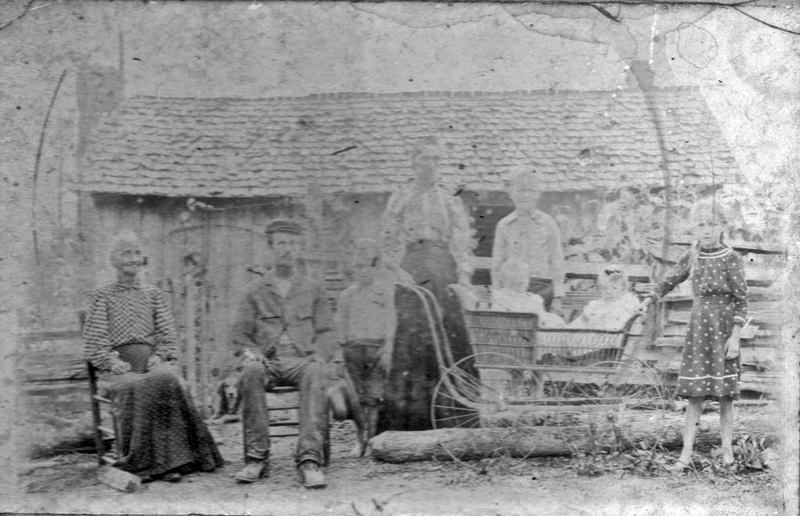 So far I have only posted pictures related to the William Harden "Bill" Patterson (1832-1883) family, but many others have been sent to me from other generations and family branches as well. Tonight I have added seven more pictures to the Bill Patterson Family Photo Gallery. They include pictures of 1) Aunt Callie (Patterson) and her husband Dutch Hickey, 2) another picture of Uncle Bunyan Patterson and his wife Arvy, 3) Uncle Lump Patterson, 4) Aunt Emma Patterson Queen, 5) Lewis G. Queen, husband of Emma Patterson, 6) Aunt Jeff (Patterson) and her husband Uncle Roe Owenby, and 7) my great-grandpa "Lije" Patterson, and his son Clint (my grandpa), and my dad Francis and all his siblings, taken in the summer of 1948 on a trip to the Blue Ridge Mountains. I also talked to my distant cousin, Dwight Mason, today. He says that the pictures his mother, my late great-aunt Nellie Patterson Mason, had are now in the possession of his brother, Dwayne Mason. I'll be contacting him soon as I know Aunt Nellie had a different picture of William Harden Patterson that I want to copy and post. Aunt Nellie was a daughter of Lije Patterson.